On 6 May 2018, the University of Dhaka held a seminar on “The Potential of Nuclear Power for Clean Energy and Sustainable Development: A Case Study of Bangladesh” at its conference room of the Center for Advanced Research in Sciences which brought together over 30 national and international energy experts, academicians, policymakers, as well as energy and power sectors’ entrepreneurs. The seminar was not just limited to discussion on the construction and operation of Bangladesh’s first Nuclear Power Plant (NPP) at Rooppur. Rather, it discussed a variety of issues relating to nuclear energy, energy security, sustainable development goals and particularly asked a central question on the readiness of building nuclear plants. The intellectual discourse also highlighted Bangladesh government’s recent energy policy regarding the participation of India under a trilateral nuclear cooperation agreement in this mega project, despite having Russia as a vendor country. The seminar commenced with the welcome address by the Chairman, Md. Shafiqul Islam, Department of Nuclear Engineering, University of Dhaka; who provided an overview of the points of discussion of the seminar. In his speech, he mentioned that the Bangladesh government has decided to construct two nuclear power units (VVER-1200 pressurized water reactors) at Rooppur with the financial and technical assistance from the Russian Federation. With these two units, Rooppur NPP has become the first ever nuclear-powered project in the history of Bangladesh which will have the capacity to generate 1200 MWe electric power in each unit. S., Islam asserts that “The titled study will generate useful knowledge and will raise public awareness about nuclear technology.” It also will help to develop agriculture, industries, and medicine sectors and open a new window to hydrogen generation and water desalination opportunities, he added. S., Islam also underscored the issue of public acceptance regarding Rooppur NPP, along with the relevant matters of high capital investment, concerns of safety and security, proliferation, and waste management. He presented a study regarding public perception of nuclear power, which had been conducted on 400 engineering students from both public and private universities across the country. In the study, it was found that 67% of them are aware of nuclear power technology and showed a positive attitude, 19% disagreed and 14% remained unaware. In order, the speakers were Professor Nasreen Ahmad, Pro-Vice-Chancellor (Academic) of the University of Dhaka, who was the chief guest; Professor Md. Hasanuzzaman, Dean, Faculty of Engineering and Technology, University of Dhaka; Mohammad Shawkat Akbar, who is the Project Director (PD) of Rooppur NPP and was the keynote speaker of the seminar; Professor Mohammad Tamim, Chairman, Department of Petroleum and Mineral Resources Engineering, Bangladesh University of Engineering and Technology (BUET); Professor Shafiqul Islam Bhuiyan, Former Chairman, Bangladesh Atomic Energy Commission (BAEC); Associate Professor ASM Ali Ashraf, Department of International Relations, University of Dhaka; and many more. After the speeches, there was an open discussion and question-answer session where the participants expressed their opinion and queries about the project and debated on the issue of nuclearization of the energy sector of Bangladesh. Broadly, the seminar focused on two major themes, namely the justification of introducing nuclear energy in Bangladesh and the opportunities and challenges of nuclear energy. The speakers discussed over several important issues regarding the nuclear project. Along with a general historical overview, the discussion emphasized primarily on the reasons and rationales behind the implementation of this billion-dollar project; the prospects and potentials of the under-constructed nuclear plant; independent legal framework; human resources, public acceptance, IAEA support; and the limitations and risks associated with the Rooppur NPP. Apart from these, the keynote speaker also discussed the implementation approach based on the IAEA milestone guidelines and the technological aspects of safety, security, and waste management. The distinguished participants in the seminar analyzed Bangladesh’s decision to go for nuclearization. Bangladesh does not have adequate energy resources to meet its requirement to support the household demand and the rapidly growing industrial and commercial sectors. For decades, Bangladesh has been mostly dependent on natural gas-fueled plants to generate electricity. At present, there is 62.5% gas, 1.96% coal and 29% furnace oil-fueled electricity plants. All these fossil fuels plants are significant contributors to the greenhouse gases like CO2 which is responsible for climate change. Bangladesh is one of the topmost sufferers of the sea water level rise due to climate change and would bring peril to its fate if continues to depend on these unsustainable and environmentally detrimental sources. Moreover, these sources are finite; and for natural gas, the primary fuel for our electricity plants, the reserves are estimated to be depleted by 2030. For oil-based plants, we need to depend entirely on import leading to an unsecured dependency factor. Despite having a vast coal reserve, coal-based plants will not be viable for our country considering its adverse effect on the environment. In the seminar, the speakers talked about the reasons behind eliminating the conventional and traditional methods of electricity production in future energy plans of Bangladesh. To avoid the adverse effects of the fossil fuel plants and to ensure future energy security by taking fuel diversification policy, Bangladesh government considered alternative and renewable clean energy sources like solar panels, hydroelectricity, and wind turbines in the coastal areas. The prospect of hydroelectricity is limited due to geographical factors and wind turbines in the coastal areas are susceptible to natural disaster-prone Bay of Bengal region. Solar plants are a potential source of electricity generation in individual and national level but require a significant amount of investment and often unaffordable for rural people. As a result, the best option is nuclear energy as a clean, sustainable, reliable, and base-load source of electricity which will be affordable in the long run. S., Akbar highlighted the reasons and justifications for undertaking this mega project, in the context of two development frameworks: one is the Paris Agreement on Climate Change, and the other is the 2030 Agenda for Sustainable Development Goals (SDGs) by the United Nations. As a signatory of the Paris Climate Agreement and a victim of climate change, Bangladesh is committed to contributing on its part by reducing the greenhouse gas emission by decarbonization of energy plants and consumption of fossil fuels to keep the increase of temperature below 1.5°C and thus thwart the pace of global warming. Bangladesh’s decision for nuclearization will uphold that commitment of Bangladesh since NPP has the least carbon emission compared to other sources of fuel. Similarly, the UN Summit on Sustainable Development 2015, has a specific agenda for energy in SDG 7, which is to ‘ensure access to affordable, reliable, sustainable and quality energy for all.’ Affordable energy not only contributes to the alleviation of poverty, the easing of inequality at the individual consumption level but also promotes the industrial and economic growth of a country. Sustainable and reliable energy is also crucial for the social, economic, environmental, educational, and cultural development of a country. The affordable, durable and reliable energy will ensure energy security which is vital to the national development of a nation. Referring SDG 7, S., Akbar stated that Bangladesh intends to achieve energy security for national development through fuel diversification and for that endeavor, building NPP is given priority. In this context, almost all participants spoke on the similar tone highlighting the relations between energy security through fuel diversification and sustainable development for a nation. S., Akbar described energy security as the combination between national security and availability of natural resources for energy consumption. He opined that “energy is vital to the economy of a country because an unhinged supply of energy would damage the economy as well as the growth and development of that country.” Many speakers emphasized that energy security requires the diversification of sources to avoid any global energy challenge, e.g., geopolitical tension and price instability in the global market. They opined that Rooppur NPP would ensure the diversification of sources of electricity generation. In this regard, M., Tamim stated that “as part of fuel diversification, NPP will not only reduce the pressure on the indigenous energy resources but also ensure supply of energy even during unintended global challenges, offering a leverage in times of crisis.” Apart from fuel diversification and energy security, a specific pride factor is associated with the acquisition of NPP due to the presence of such NPPs in India and Pakistan, he added. The seminar’s discussions put light on Bangladesh’s journey towards building NPP. Bangladesh’s first step to build NPP began in 1962 with the selection of Rooppur NPP site, by the Site Selection Committee of Pakistan’s Ayub Khan regime. Covering an area of 1270 acre, it is located in Pabna district, 160 km north-west from Dhaka. Although situated in the eastern bank of the Padma river, the site has natural elevation to avoid flooding and is the lowest seismic hazard zone of the country. Bangladesh’s incumbent government undertook a plan as per its national energy strategy to establish two NPPs in Rooppur with a capacity of generating 1200 MWe of electricity each. The Russian ROSATOM will build the power plants and handover it to the owner, BAEC, after successful commissioning. The NPPs will be constructed based upon the VVER-1200 model technology which is generation III+ reactor and has the latest safety features in the post-Fukushima accident, as outlined by IAEA. Since Bangladesh is a new NPP country, IAEA will provide all technical support to ensure safe, secure, and successful implementation of Bangladesh’s NPP. IAEA, as per the milestone guidelines, will also provide workforce training and advisory expert services, conduct different review missions and develop Integrated Work Plans (IWPs) for the Rooppur NPP. S., Akbar elaborated on the current infrastructure development works in the Rooppur NPP. 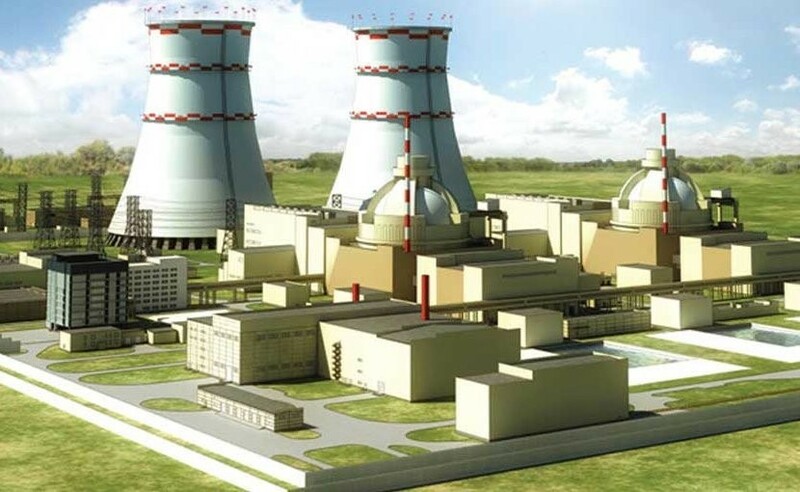 The NPP has a two-stage construction plan, the preparatory stage from 2013 to 2017, which is already completed and the currently ongoing main stage, which is to be completed between 2017 and 2025. The first stage covers the engineering surveys, environmental studies, preparation, licensing of the plant and construction of auxiliary facilities, required for the final stage construction of the NPP. The main stage covers the detailed technological designing and construction, procurement and final handover to the owner BAEC. About the Rooppur NPP, M., Tamim said that each of the 1200 MWe units would require 25 tons of fresh fuel annually which will be transported in 14 trucks. He also pointed out that the NPPs will have dual safety features (active and passive) for the reactivity control of the reactors. And they will also have huge capacity water accumulators for ensuring core heat removal and for the confinement and reliable retaining of radioactive fission products. The majority of the speakers and experts present in the seminar argued in favor of nuclear energy, its potentials, and opportunities for Bangladesh. They asserted that Bangladesh, as a developing nation with more than 7% GDP growth, needs to ensure energy sustainability for the growing industries and production sectors as well as to make a trade and business-friendly environment. As a source of electricity, NPP provides uninterrupted power supply in a large scale over a longer time period, benefitting the industrial sector and thus directly contributing to the economy. Relating to this, Bangladesh has a vast energy demand to be met for its economy and the demand is increasing 10% every year and projected to be 24,000 MW, 40,000 MW, and 60,000 MW by 2021, 2030, and 2041 respectively, according to the Government’s Power System Master Plan (PSMP) 2016. To achieve this, Bangladesh wishes to rely on nuclear energy. Also, the NPP facility needs low operational and management cost. And, its transportation cost is less than the amount spent behind that of the plants with coal, gas or oil. Also, it requires a significantly small amount of nuclear fuel compared to the other plants. While the burning of fossil fuel inside the plants leads environmental hazards, fission of nuclear fuel inside the reactor does not produce any flame or releases any harmful gases, smoke or ash and maintain a clean environment around the plant. Moreover, Rooppur NPP is not merely a source of electricity generating unit, rather a milestone step to uplift the economic, social, and political status of the country in the global arena, said Col. A.Z.M Salahuddin from the Military Institute of Science and Technology and Engineer Md. Rabiul Alam from the Energypac Power Generation Ltd. It will open up vast potential for the research and development in medicinal, agricultural, and educational sectors, they added. Besides, Rooppur NPP will create a window of opportunity for the development of domestic workforce and expertise in nuclear plants and projects. With gradual training and assistance, Bangladesh would be able to have our national construction firms like India and Pakistan. And, in future, Bangladesh can produce necessary materials locally by generating a new industrial and manufacturing capability. Furthermore, the participants argued that Bangladesh government envisions to provide electricity to all by 2021 and eradicates poverty by 2030. To realize this goal, Bangladesh’s PSMP 2016 aims to create a reliable power generation environment that maximizes the respective advantages of different types of power generation methods including nuclear power, thermal power, hydropower. It also emphasizes on power imports from neighboring countries based on the comprehensive perspective of stable supply, environmental performance, and economic efficiency. PSMP 2016 highlights the necessity to secure a consistency between the country’s economic development strategy to become a developed country as per the ‘Vision 2041′ and the electricity generation capability. As envisaged by PSMP 2016, the Rooppur NPP will have two additional units by the year 2030 and two more units at southern part of the country by the year 2040. The seminar was hopeful that Rooppur NPP will significantly contribute to the economic development of Bangladesh. The seminar discussions also highlighted the challenges for Bangladesh’s nuclearization. As a new NPP country, Bangladesh does not have the trained and expert workforce to run and operate a NPP. M., Tamim raised his concern in this regard mentioning UAE, where the construction of 4 NPPs are going on with foreign assistance. For the VVER Generation III+ type reactor at Rooppur, Bangladesh does not have a necessary workforce. Though signed a trilateral contract with India and Russia, Bangladesh cannot solely depend on outside support, as it requires approximately 3000 people to operate. Hence, education and training in this sector is a primary concern. In this aspect, the Russian First Secretary Alexander Demin pledged their support in the training programs for human resources development. He mentioned the ongoing bilateral exchange education programs for nuclear engineering at top Russian universities, and presently 50 students are studying in the undergraduate and graduate levels. He also said that the Russian cultural center is working with the stakeholders to facilitate the process. Similarly, many experts agreed that Bangladesh does not have an independent regulatory body to supervise and monitor the legal aspects in all implementing stages of the project. M., Tamim mentioned that the Nuclear Energy Programme Implementing Organization (NEPIO) which was established in 2010, lacks sufficient expertise. He also stated that Bangladesh Atomic Energy Regulatory Authority (BAERA) does not have enough trained human resources to oversee the peaceful uses of nuclear energy. Not only that, the Rooppur NPP requires massive financial and technological support which is a significant challenge for Bangladesh. There are cases even in countries like the US, UK, and Finland; where the construction of the NPPs had to be abandoned due to the lack of finance. Technologically, faulty designs or constructions might create difficulties, said Prof. Ijaz Hossain, a noted energy expert from BUET. The seminar participants also debated the safety and security concerns of the NPPs. Some NPP advocates argued that under the close observation of IAEA, the risks of proliferation remain minimum. And there will be military-backed elite squads of law enforcement teams to provide security of the facility. Conversely, others asserted that there remain technical, economic and political risks. One of the significant challenges is establishing a relationship between the national power grid and the reactor technology, mentioned Md. Mizanur Rahman, Member, Bangladesh Energy Regulatory Commission. The cost and funding of the supply management, wiring, and infrastructure facility for the distribution of the electricity generated will take a toll on the budget, he added. However, the speakers debated over the maintenance and performance issues of the Rooppur NPP within the timeline. Highlighting the possible delay of the NPP, M., Tamim argued that the goal of having the NPPs by 2024 is not feasible. He cited the example of Iran’s Bushehr power plant which took 20 years. Any delay and interruption will pose the challenge of cost overrun in Bangladesh, he stated. On this issue, S., Islam stated that it takes 5-6 years from the day of concrete pouring of the reactor building on 30th November 2017 to produce a NPP so that Bangladesh can have it by 2024. Another point of debate was the fate of the NPP’s spent fuels which are highly radioactive and a serious security concern. Some mentioned that the means and routes of transporting the spent fuels remain unclear and involve risks. On this issue, S.I. Bhuiya suggested that Russia will safely take back the spent fuels, of which 95% in volume is a non-radioactive waste. Apart from this, significant criticisms came upon the viability of the nuclear project, its cost-effectiveness, the environmental hazards and risks associated with it. Questions had been raised on the per unit electricity cost by the NPP and the cost-effectiveness of the project by comparing with the other means of electricity generation like oil, coal, gas or solar power. Ijaz opined that renewable energy from Bhutan and India could be a potentially useful alternative to NPP. He also questioned the cost-effectiveness of the nuclear option and criticized the undertaking of such a massive investment for a poor country like Bangladesh. Others brought the issue coal-based power plants and indicated Bangladesh government’s reluctance and lack of political will in that regard. As an alternative to NPP, another expert mentioned the possibility of gas exploration in deep sea which has been negated for unknown reasons. The most vehement criticism came from the Marxist critic M., Sultana, a DU faculty who raised the point of liability regime which is still unclear in Bangladesh. Stating the high risk of accidents, she argued that “since any NPP involves severe accidental risks, the issue of civil liabilities is a matter of utmost significance which is continuously avoided in this case”. Since it is a concern for the civilians, the government should evaluate public opinion which has been taken as granted, said Moqbul-e-Elahi from Petrobangla. The seminar revealed that the path towards NPP has various challenges and opportunities. For Bangladesh, the financing and funding, human resources, infrastructure development, legal framework, safety culture, and technology transfer are the key challenging issues. Also, there remains a significant misperception among mass people about the NPP. However, Bangladesh’s journey as a newcomer nuclear country is a milestone for the country’s energy security and flagship for economic, social, and political status in the world. The organizer of the seminar expects that this intellectual discussion will provide thoughts and insights for the government, policymakers, competent authorities as well as the general public about the country’s nuclear journey.